Indian scientists have developed a computer program for drug research designed to reduce the number of animals used in laboratory experiments. The software, called Drug Discovery Assistant or DD Assist, is being used by India's Central Drug Research Institute (CDRI) in the northern city of Lucknow. Director of the CDRI, C M Gupta, said that the program will reduce the use of laboratory animals by nearly 90%. 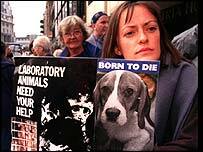 Now only two or three of the trials will be conducted on animals, compared to between 20 and 30 in the past. Most of the tests will be done by a computer model which relies on four databases. Selected molecules are passed through each database for their prioritisation as potential drug candidates. The software application has databases on specific diseases like diabetes, dyslipidemia, cardio vascular system disorders and diseases affecting the central nervous system. It also has data on drugs in use, failed or withdrawn drugs and candidate drugs. Scientists say the new software will drastically reduce time and cost of coming up with a new drug. At present the laboratory is spending 20 to 25 years in developing a new drug. During this time some of the drugs become obsolete . Now the research time will be reduced at least by half. This will help the Indian drug industry compete with the developed world. Scientists say similar technology is already being used by developed countries. But costs were high and beyond reach of the Indian medical industry. The Indian software DD Assist is much cheaper. Scientists have described it as a major step for the drug research industry, which felt handicapped in competition with research groups in developed countries. The software was developed by Invenio Biosolutions in Delhi.